It came in a little cardboard mailer. Aspen/Snowmass, the resort area to the stars, where the average price of a house is $4.2 mil, sent me a CFL today. 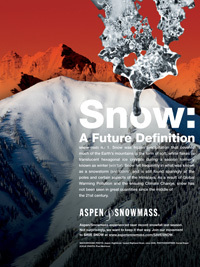 I'll admit, I visit Aspen annually with my family and so am on their mailing list. I'm guessing that the CFL is actually their yearly pre-season gift (last year it was a calendar). So, I'll take a free CFL, but it got me wondering... why? It looks like this is recent spate of generosity is part of A/SM's SAVE SNOW campaign. The campaign is part of a larger environmental commitment that A/SM has going on and it shows how enlightened governance can make a difference. As part of the campaign they have produced a transparent and valid sustainability report (downloadable at their site), an Amicus Brief to the Supreme Court on carbon dioxide regulation, they have testified in front of congress, and they purchase significant RECs. I know what you're thinking. A/SM needs snow to continue to make profit, so they are just being self serving. But, lots of companies need lots of resources to operate and oh so few are actually walking their walk. I say kudos to A/SM for walking their walk, trying to educate consumers (many of whom probably don't have the most eco-friendly lifestyles) and giving away swag that we can actually use. Jennifer Kaplan is a principal at Greenhance LLC. If you purchased one or two-stage gas snow blower, be sure to start with the outside world. Carbon monoxide Best snow blower poisoning, an invisible killer. Snow removal is hard enough without worrying about the carbon monoxide. Woo this is a nice blog, i would love to read more. It's been years since I've seen you and Marco in sunny Cali. Cell phones and ski resorts are a good thing, as is a movie like "Ski School" (1991) Why? Because it saves money on telephone poles and expensive gasoline-chugging travel.